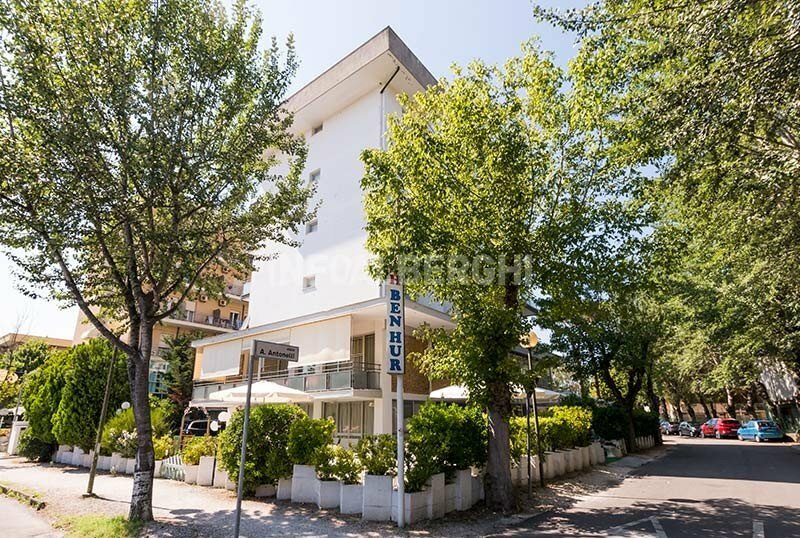 The family-run 3-star Hotel Ben Hur in Valverde at Cesenatico has a garden, free parking and bicycles. Accepts small pets. The hotel is located in Valverde at Cesenatico, about 5 minutes walk from the sea. All rooms are equipped with balcony, air conditioning, WI-FI, safe, telephone, satellite TV and 24 "LCD digital terrestrial, bathroom with shower cubicle, suspended bathroom fixtures, hairdryer and courtesy kit. Garden, open-air porch, free bicycles, bar, newspapers in use, lift, welcome drink, theme nights. PETS: small pets are allowed free of charge. LUNCH AND DINNER: menu with 3 choices of meat and fish, buffet vegetables, pasta and homemade desserts. Water and wine with meals are included. In the hotel: indoor / outdoor playground area, paid pediatrician. At meals: high chairs, baby menus, baby food, bottle warmers, afternoon snacks.